Academy Award winner Judi Dench and Sophie Cookson (Kingsman: The Secret Service 2014) take on the complex persona and legacy of Joan Stanley, the seemingly demure physicist who was also a long-serving British spy for the KGB. In a picturesque village in England, Joan Stanley lives in contented retirement. Her tranquil existence is shattered as she’s shockingly arrested by MI5. Joan has been hiding an incredible past; she is one of the most influential spies in living history… We flashback to 1938, Cambridge, where young Joan falls in love with Leo, a dashing idealist in search of adventure. Through him, she begins to see that the world is on a knife-edge and perhaps must be saved from itself in the race to military supremacy. Post-war and now working at a top-secret nuclear facility, Joan is confronted with the impossible: would you betray your country and your loved ones, if it meant saving them? What price would you pay for peace? 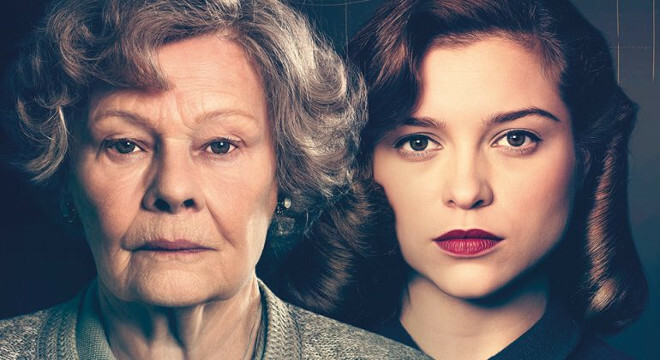 Based on the eponymous novel and inspired by an extraordinary true story, Red Joan is the taut and emotional discovery of one woman’s sacrifice in the face of incredible circumstances. Lindsay Shapero's crisply structured script darts between the elder Joan's interrogations and the younger Joan's life of secrets and jagged alliances. She's never certain whom to trust — and we might not be certain if we can trust her. But Joan's fascinating story validates Jean Renoir's timeless adage: "Everyone has their reasons."